The aircraft we were flying on in a recent trip circled on the approach to NAIA and we were afforded some terrific opportunities to take aerial shots of Quezon City. This was before the rains of the Christmas holidays so the skies were clear of clouds. Here is one of the photos I took showing the University of the Philippines Diliman campus. That wide road on the left is Commonwealth Avenue and you can see part of the Elliptical Road at the bottom left. There are few large patches of green in Metro Manila and many are in the largest city – Quezon City. You can see that these include the campus and Balara. Aerial photos are no longer that rare these days as there are many who take shots from drones. Then, of course, there are shots like these you can take from the plane you’re riding. Have a nice Sunday! I decided to take Emirates for my recent trip to The Netherlands as I opted to have a stopover in Dubai to have some recovery time. Travel time between Manila and Dubai took about 8 hours and between Dubai and Amsterdam about 7 hours. I thought (and friends have also told me) that this was better than having a very long flight where you’re practically confined to the aircraft. I have also been informed that the inflight meals on Emirates were better than most airlines even on economy. I must agree with that observation and I’m now posting some of the “stolen” shots I took of the inflight meals. The lunch selection was okay and I always thought that one doesn’t have to gobble up everything served to you inflight. Eat and drink just enough so you won’t feel hungry or thirsty on a long flight. Check out the food if the taste suits you. If you don’t feel eating or it doesn’t taste right to you then perhaps you should pass or opt for some light snacks. My flight to Melbourne was via Sydney. I chose Qantas because of the more favorable schedule as well as the cheaper fares the schedule provided compared with Philippine Airlines and Singapore Airlines (via Singapore). And so knowing I would have to transfer at Sydney airport, I decided to have more than an hour’s layover there. It turned out to be a good decision as we had to pick-up our luggage, clear customs and then walk over to the transfer area at the international terminal to have our check-in luggage tagged and dropped off before proceeding to ride a transporter (bus) to the domestic terminal. It was also a good thing that Qantas already thought about such transfers and had good facilities and service for such. Needless to say, the transfer was smooth/efficient. We had to walk towards the Qantas transfer facility to have our baggage tagged and dropped off for our connecting flights. In my case, that was for my journey to Melbourne. After dropping off our luggage, we waited to board the bus that would take us to the domestic terminal. The service frequencies are shown in the sign above. I was near the front of the line is I was able to board early and take a photo as people were just filling the bus. Scenes of aircraft ground operations while we were in transit from the international terminal to the domestic terminal includes this American Airlines jet replenishing on inflight meals. Here’s another view of the same jet getting serviced at the airport. This is the scene when we arrived at the domestic terminal. Passengers at the terminal were also waiting to board the bus bound for the international terminal. En route to my boarding gate, I took a few photos of the corridor lined with various shops. There were also cafes and restaurants for those wanting to have or grab a quick meal or drink. I arrived at the boarding gate with much time ahead of my flight. There were, however, many passengers already waiting, too. It seems crowded but there were enough seats for those wanting to relax while waiting for the boarding call. Others seem to prefer just standing (healthier?) there. It was still early in the morning so most people were just quiet or conversing softly with fellow travelers. I myself was a bit sleepy and looking forward to taking a nap on the 1.5-hour flight to Melbourne. We mistakenly went to San Diego Airport’s main terminal. It turned out that our flight to Los Angeles would be via the smaller commuter terminal. It’s a good thing that they had an airport shuttle for the convenience of passengers traveling from one terminal to another. The commuter terminal sort of reminded me of the old low cost carrier terminal at Singapore’s Changi Airport but San Diego’s I think is much better in terms of amenities and design. Passengers waiting for their flights relax by conversing with their company, having a drink, listening to music or reading or just plain sitting and looking around. There’s a news stand at the terminal for those who want to grab something to read for the short flight or for later. The path to the plane was clearly marked. We were fortunate that the rains stopped prior to our boarding the aircraft. 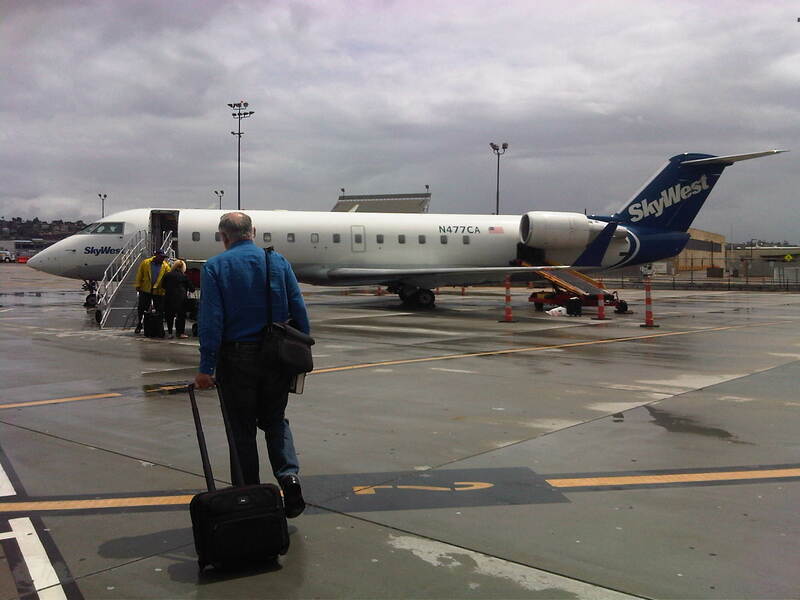 Our SkyWest plane is the smallest jet aircraft I’ve ridden on. The last time I was on an airplane of this size, it was on a turboprop between Tacloban and Manila. The space above the seats was limited and could probably fit a briefcase sized bag so if you have one of those backpacks or thicker bags with your computer, you would have to place them under the seat in front of you. Of course, this can be uncomfortable to many considering the also constricted leg room in these small aircraft.